The reality of his job is quite a different experience. 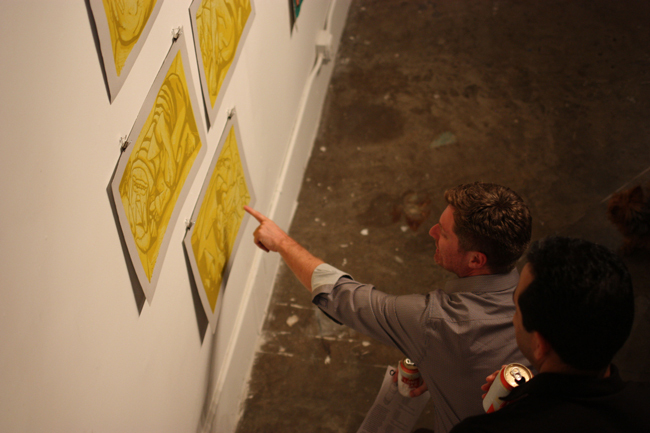 Morgan describes himself as “just a normal guy in a uniform who, for some reason, is in charge of caring for some of [the residents’] most valuable assets.” However, through his most recent artistic endeavor — a painting series and accompanying narrative named "Canned" exhibiting at Austin’s Not Gallery in collaboration with Raw Paw — the artist shares his wild fantasy, and in this way, makes it come alive. The imaginative and cartoonesque paintings and drawings of "Canned" tell a very real story of the wealth divide, from the perspective of Morgan’s looming office window. From their luxurious apartment views, the building residents (or “Tower People,” as he calls them in the narrative) look down upon a group of “Can Collectors,” who flock to the recycling bins every Tuesday to fill shopping carts full of five-cent aluminum pieces. 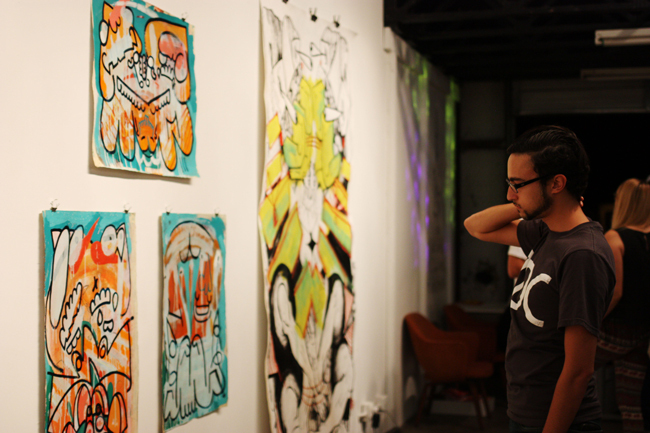 Morgan’s paintings reflect the tower residents and the collectors as characters in his wild, abstracted style. He points out how “the Tower People are very detailed, and the Can Collectors are very abbreviated, cartoonish.” The portraits of the Tower People parallel their reality in the sky-high apartments, placed above those of the Can Collectors on the wall of Not Gallery. They are portrayed in book-walled rooms, holding glasses of wine or cigarettes, with distressed expressions and contorted postures. Morgan gives them extra limbs and fantastically grotesque features. Despite the building’s glamorous reputation, Morgan says that the Tower People do not seem content with their lives, either. Morgan describes them as “wealthy shut-ins, estranged wives and stock market players” who are “getting through divorces, have multiple wives” or coping with other struggles. “These are very unhappy people,” Morgan says. 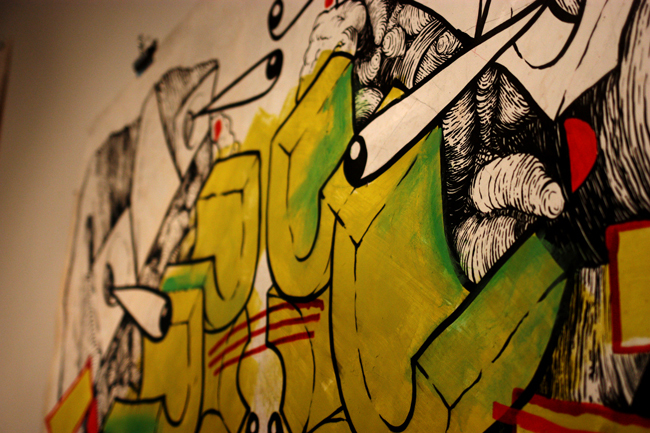 In the exhibit, the Can Collectors are clearly inspired by the bright colors and loose, heavy lines of graffiti art. 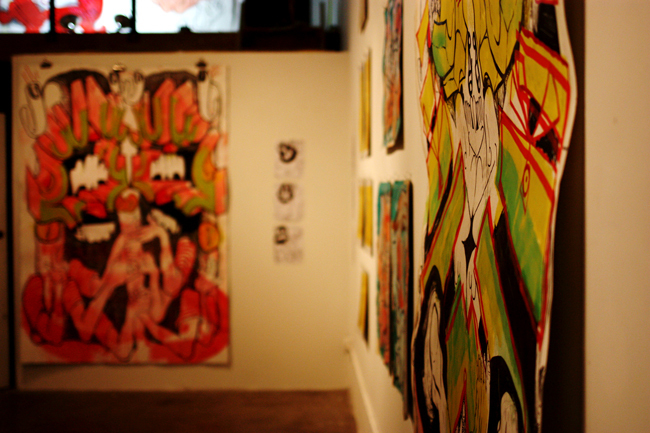 Morgan credits his adolescent attraction to street art as inspiration. 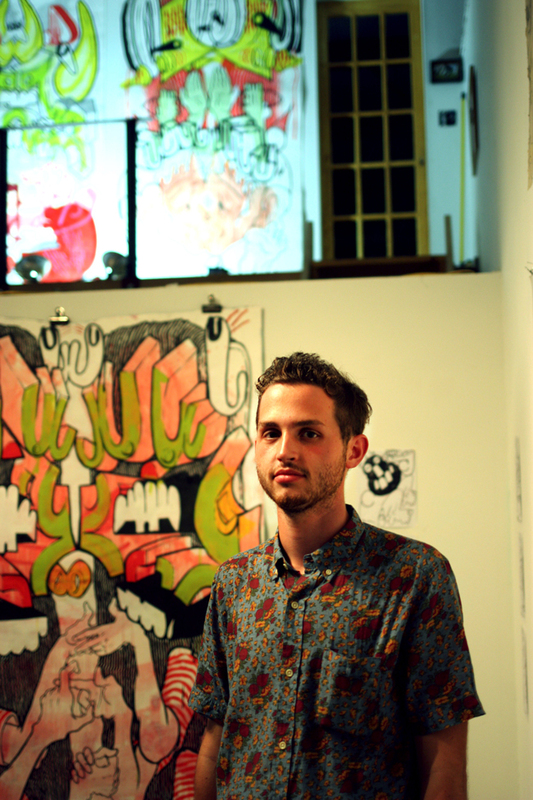 “Like in the action of writing graffiti,” Morgan says, “I paint very quickly and intuitively, which gives my work playfulness and action.” He traces his style back to drawing stills and characters from cartoons like “Ren & Stimpy” and “Spongebob Squarepants.” Even Morgan’s father, Bob Morgan, recalls the influence cartoons had on his young artist-to-be. “Sean picked up a magazine with Bugs Bunny on it and drew an exact replica at 8 years old,” he says, prompting him to get his son into art lessons. "Canned" is relatable whether the viewer connects with the life of the Tower People or the life of the Can Collectors. . “I thought it was such a cliché, the early-20’s good and evil, but when people talk about the wealth divide, they never come up with a solution,” Morgan says. “I thought I could make this stupid hippy solution, like utopia, where everyone is happy, running around, holding hands.” In his monumental-sized paintings, Morgan depicts this “utopia,” his fantasy world where the Tower People and Can Collectors come together in graphic symmetry. The playful togetherness of Morgan’s fantasy party is embodied by the paintings’ celebratory unity. Flailing limbs entangled, the detailed, sketchy features of Tower People mingle with the graffiti-like shapes of Can Collectors. At his show, Morgan motions to the walls of the gallery and explains, “this, combining the characteristics of the two, is them, hanging out, drinking, playing footsies, handshaking each other,” living out his imagined party on a paper canvas. 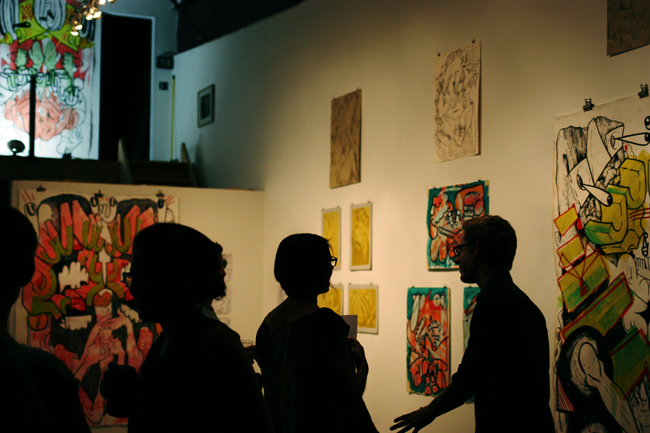 See "Canned" on display at 6 p.m to 9 p.m. through October 15 at Not Gallery.